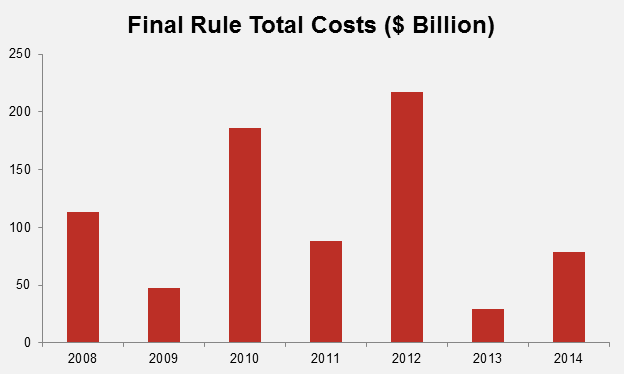 In 2014 alone, regulators published more than $181 billion in new regulations. There is little doubt the president will impose yet another $100 billion tab on the American people in 2015. Congress, however, does have legislative tools to address these controversial new rules. The Congressional Review Act (CRA), passed in 1996, allows legislators to introduce a resolution of disapproval to rescind a regulation. If successfully passed, the rule “may not be reissued in substantially the same form.” In practice, this would end the life of the regulation permanently. In theory, when the Office of Information and Regulatory Affairs (OIRA) designates that a rule is major (an annual effect on the economy of more than $100 million), the promulgating agency must send a report to the Government Accountability Office (GAO) and both houses of Congress. In practice, there are thousands of rules that agencies never bother sending to GAO, but Congress can still take up debate on these measures. Once transmitted to Congress or published in the Federal Register, Congress generally has 60 days to take up a resolution of disapproval on an expedited basis. If Congress recently adjourned to start a new session, the 60-day period is extended into the next session, beginning on the 15th session day after Congress reconvenes. The CRA provides for expedited consideration of resolutions of disapproval, mainly in the Senate. In each house, resolutions are generally referred to the committee with jurisdiction. However, if 30 Senators submit a discharge petition, then the resolution is automatically placed on the floor. Once on the Senate floor, a motion (generally by the majority leader) to proceed is “in order.” If a motion to proceed is adopted, any motion to reconsider is prohibited. No filibuster of the resolution of disapproval is possible during debate, as time is limited to ten hours, divided between supporters and opponents. At the conclusion of debate, the Senate automatically proceeds to a vote, with the exception of one quorum call. Although the president is unlikely to sign a resolution of disapproval for one of his own regulations, Congress can still delay the regulation. Once the president vetoes a resolution, the 60-day clock is extended by an additional 30 session days. However, the CRA is silent on how this 30 days is calculated if the House and Senate are in session on different days. In practice, it likely means Congress could delay the effective date of a regulation by more than a month once the president initially vetoes the resolution. Congress can override a veto, generally without a filibuster or significant delay, but only with a two-thirds majority. This is unlikely in any political environment, which is why the CRA has only been successfully used once, to overturn an ergonomics rule in 2001. Gainful Employment: Not transmitted to Congress until November 17, 2014, there is still time to repeal the regulation that costs more than $433 million annually and could kick more than 500,000 students out of higher education. Courts have already struck down a previous iteration of the rule. Greenhouse Gas Standards (GHG) for New Sources: EPA’s rule is scheduled to be final in January, giving Congress plenty of time to review a measure that ostensibly bans new coal-fired power plants. GHG for Existing Sources: The $8.8 billion annual price tag will surely pique the interest of Congress, not to mention the extreme breadth of regulation. EPA seeks the power to not only control existing sources of GHG, but also demands that states fundamentally alter their electricity markets, dispatch rates at natural gas plants, and energy efficiency at every conceivable level. Coal Ash: EPA finalized the rule in December of 2014, but it has still not been published in the Federal Register. This $20 billion rule would require yet another major round of modifications at power plants. Calorie Labeling for Vending Machines and Restaurants: These completely redundant regulations will cost roughly $1.7 billion, impose almost two million paperwork burden hours, and raise the price of food for all Americans. Ozone: Although only recently proposed, this $15 billion rule affecting every state has a chance to be final in 2015, giving Congress an opportunity to scrutinize the measure. Costs and economic implications will be profound, regardless of the final rule’s language. Net Neutrality: The Federal Communications Commission (FCC) has indicated that they’ll vote on a final rule by February, leaving Congress plenty of time to disapprove of a rule that could increase taxes by $15 billion and fundamentally remake the telecommunications industry. AAF has data on costs, benefits and paperwork for all rulemakings published since 2008. Every regulation that imposes a private-sector burden, intergovernmental cost, or paperwork burden is recorded weekly on AAF’s website. The graph below details some of that data: total costs from 2008 to 2014. In short, the regulatory state is thriving. Regulators have published $760 billion in new regulatory costs during the last seven years, with $647 billion from the Obama administration. 2008 was a bit of an outlier, known as a “Lame Duck” year, when historically, administrations have worked quickly to finalize their regulatory priorities before the next president takes power. The CRA is an important oversight tool that Congress can use to check and delay regulatory overreach. There are other options as well: codifying executive orders on regulatory reform, appropriations riders, and piecemeal reform. Regardless of the specific tactics, there will be no shortage of controversial regulations for Congress to address this session. This study explores a range of public policy options to increase labor force participation.